This piece follows my reading suggestions for new Wodehouse readers with a reading list for the Jeeves and Wooster stories. *The World of Jeeves is currently available in print for around £8, and includes the short stories contained in Inimitable Jeeves, Carry On, Jeeves, and Very Good Jeeves. The Right Hon. was a tubby little chap who looked as if he had been poured into his clothes and had forgotten to say `When’. Bertie Wooster and his resourceful manservant Jeeves appeared in over thirty short stories between 1915 and the publication of their first novel, Thank You, Jeeves, in 1934. Wodehouse was a master of the short story format, and the stories include some of Bertie’s most memorable adventures. They’re a terrific introduction to the series and its characters. Reading them first will avoid plot spoilers, and ensure you appreciate all the ‘in jokes’ throughout the series. The short stories first appeared in magazine format before their publication in three volumes as The Inimitable Jeeves (1923), Carry On, Jeeves (1925) and Very Good, Jeeves (1930). Their order of appearance in these volumes differed from the original publication order, and some of the titles were changed. Wodehouse also included reworked versions of earlier stories, featuring a character called Reggie Pepper, as Bertie Wooster stories. The three short story collections were collated in a 1967 Omnibus, The World of Jeeves, with an introduction by P.G. Wodehouse. The stories were reordered to better resemble their original publication order, and some are listed under their original titles. The World of Jeeves also includes two later Jeeves stories, ‘Jeeves Makes an Omelette’ and ‘Jeeves and the Greasy Bird’, which appeared in A Few Quick Ones (1959) and Plum Pie (1966). The stories refer to characters and events from the later novels, so if you can exercise an iron will and leave off reading them until later, you’ll avoid spoilers. But no great harm will befall you by reading them first. The ‘first’ Jeeves and Bertie story, ‘Extricating Young Gussie’ (1915) is not included in any of these volumes. Originally published in The Saturday Evening Post, it appeared in the 1917 short story collection The Man with Two Left Feet. There is some debate about whether the Bertie in this story should be rightfully considered Bertie Wooster, or some other Bertie of the Mannering-Phipps variety. These are the sorts of debates you may find yourself entering once you’ve become hooked on the series. As the early collection My Man Jeeves (1919) was rewritten and incorporated into the later stories, it is recommended for enthusiasts and collectors, but not as a starting point for new readers. The novels introduce memorable new characters to the Jeeves and Wooster cast including Augustus Fink-Nottle, Madeline Bassett, Sir Roderick Spode, the Stoker gang, ‘Catsmeat’ Potter-Pirbright, and his sister Cora. He spoke with a certain what-is-it in his voice, and I could see that, if not actually disgruntled, he was far from being gruntled. Many people start their Wodehouse reading with The Code of the Woosters. As a highly-regarded classic, it’s a volume most booksellers tend to stock. The Code of the Woosters is also a favourite with fans, who recommend it to new readers with enthusiasm. No great harm will befall you by reading this, or any other book, out of order. Finally, if this reading list leaves you wanting more, there’s also the 1953 novel Ring for Jeeves featuring Jeeves without Bertie Wooster. My affliction with Wodehousitis is perhaps acute. The order of publication has really never mattered to this lesser mortal. Savouring any of his works alone matters! I too read Wodehouse thoroughly out of order, but it was not by choice. It was simply a case of reading whatever book I could lay my hands on next — this was in the days before online booksellers and ebooks made all of his works available, anywhere in the world. Finding books by Wodehouse (beyond the 2-3 most popular Jeeves titles) in Australian bookshops was quite difficult at the time when I was setting out to read them the first time. I was content to read whatever I could find, because — like you — I was addicted. It’s all good stuff! But today’s new Wodehouse reader has a choice about the order in which they read the books, and it is a question that is often asked, so I figured a list of some kind might be useful. Yes….let his unalloyed bliss pour in from all sides! I can’t remember which Wooster and Jeeves book was the first I read but I do know the first one I bought, because I still have it: the 1961 Penguin edition of The Mating Season. I don’t remember when I bought it but it wouldn’t have been much later than that. It’s a bit battered now and very brown but still intact and still gets read. I didn’t get to the first PGWs until much later, around the mid-70s when I was started haunting second hand bookshops to build my collection. I approach each one individually so the order doesn’t matter to me. I tried to get one of my sons interested in PGW and started him off with, I think, Right Ho, Jeeves, which is my No.1 pick in a close contest with, of course, The Code of the Woosters. This hasn’t done the trick, which bolsters your view, Honoria — should have started somewhere else. May I suggest the Weekend Wodehouse anthology? I lent one of my copies to someone — I’ve forgotten whom (yes, whom) — who wanted to try the old boy and it has not boomeranged. Acceptance of a sort, I guess. I hope it has a good home. Long-winded as usual. Sorry. Toodle-pip. What Ho, Noel. And what a lovely story about The Mating Season. It’s one of my favourites Good advice on Weekend Wodehouse. I’ve had recent success with Ukridge also. I don’t recall my first Wodehouse but I think it was probably Carry On Jeeves. The book that converted me to a fan to a fanatic was the first Blandings novel — Something Fresh. Must be something to do with the ‘psychology of the individual’. Toodle-pip to you too! 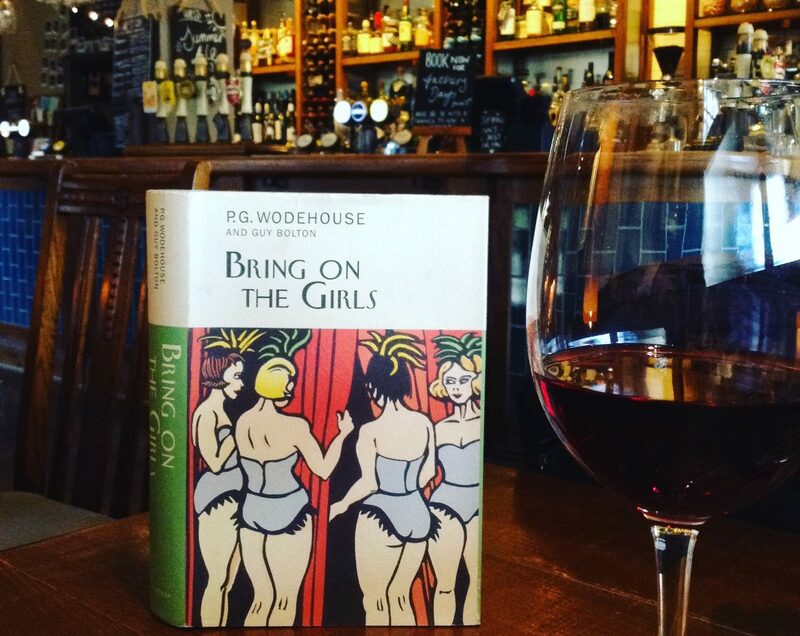 For those who are new to the world of P G Wodehouse, here is a post which offers interesting tips on where to start devouring his sunlit works. To those who already reside in Plumsville, this post offers a new perspective on the order in which his works may be savoured. I would recommend reading the novels starting with the first one, Thank You, Jeeves, which is of the same high level as the masterpieces, has some of the best set pieces in the series, and is certainly better than the later ones. Thanks Derryl. Your advice is good and I think a lot of people would agree with you. I confess I’ve also been surprised at how many people would skip the short stories. Geeves serious is the most famous comedy serious. Need all geeves serious in bangla. The initial quadrilogy of Jeeves and Wooster books, Thank You, Right Ho, Code and Joy in the Morning, are the best series of comedy books in the English language. An excellent guide to reading the Jeeves and Wooster stories of P G Wodehouse. I should point out that, as noted in my post “How to read P G Wodehouse: a new prescription, which reviews “Ring for Jeeves”, although Bertie Wooster does not appear in the book, his doppelgänger, Bill Rowcester, does. There is of course no city called Rowcester but there is a city called Worcester – pronounced Wooster. An excellent guide to reading the Jeeves and Wooster stories of P G Wodehouse. As concerns “Ring for Jeeves” featuring Jeeves without Bertie Wooster, it is perhaps worth noting, as I mention in my post “How to read P G Wodehouse: a new prescription”, that although Bertie indeed does not appear in the book, his doppelgänger, Bill Rowcester, does. There is of course no city called Rowcester but there is a city called Worcester – pronounced Wooster.